This is the site of the Komatsubara Persecution, one of the four major persecutions that Nichiren Shonin faced. It was the most severe of the persecutions. Two of his disciples were killed, and others in the party were injured. The present day temple grounds are so peaceful that it makes it seem an unlikely place for such a persecution to have taken place. On November 11, 1264, while Nichiren Shonin was staying in the Boso area of Chiba, one of his followers, Lord Yoshitaka Kudo of Amatsu, invited him to visit. Nichiren Shonin and ten of his followers left Rengeji Temple in Hanabusa. They were walking along on a road in Komatsubara when they were attacked by Kagenobu Tojo and his men. Kagenobu was a strong Nembutsu believer who disliked Nichiren Shonin’s criticism of his faith. Nichiren Shonin protected himself from Kagenobu’s sword with his juzu prayer beads. Nichiren Shonin was wounded, but the cut was only about three inches long. Nichiren Shonin’s disciples, Kyoninbo and the Lord Yoshitaka Kudo, who had come when he heard of the attack, were killed, and two others were seriously injured. Later one of Lord Yoshitaka Kudo’s sons, Nichiryu, became Nichiren Shonin’s disciple. 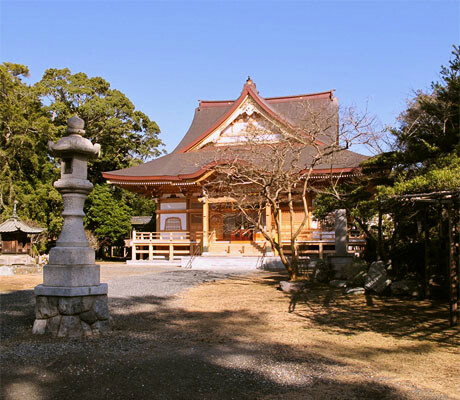 In order to assure prayers for the late Kyoninbo and his father, Nichiryu founded Kyoninji Temple on March 5, 1281. An 800-year-old cedar tree stands in the temple’s yard. The temple has a Soshi-do (Founder’s Hall), which was built in the middle of Edo period, a Hondo (Main Hall), a temple office, and a gate. The temple also cares for such sacred treasures as Nichiren Shonin’s writing, “Tokidono Gosho,” the juzu prayer beads that protected Nichiren Shonin from the blow of the sword, the blood-soaked robe of Kyoninbo, and pictorial history books about Nichiren Shonin.